These purple wedges are sweet and creamy with just the right crunch and smokiness. Dunk them in earthy and peppery turmeric aioli. Perfection! Caution: Turmeric stains skin, surfaces, and clothing. Use gloves and cover surfaces with plastic wrap. Special equipment: food processor. Turmeric may stain food processor bowl and the hub of the processor blade. Rinse immediately after use and check out our stain removal tips. Bring large pot of lightly salted water to a boil. 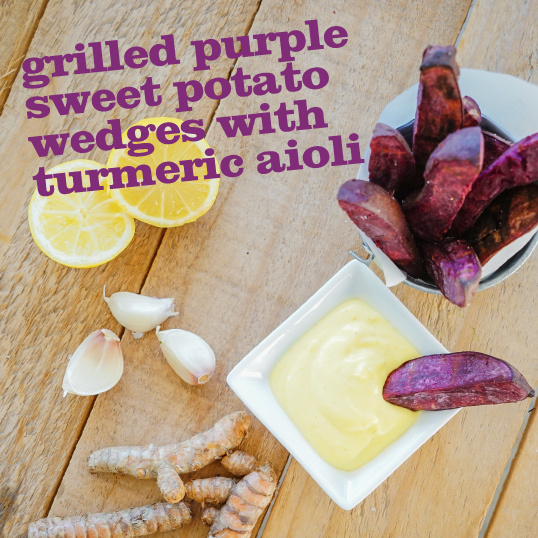 Carefully add purple sweet potato wedges and cook until just fork tender, 4-5 minutes. Drain wedges and toss with 1/4 cup olive oil, then season to taste. Grill potato wedges about 3-4 minutes per side, turning once. Meanwhile, in food processor container, pulse garlic and turmeric until chopped. Add mayonnaise, lemon juice, and remaining 1/4 cup olive oil, then blend until smooth. Season to taste—especially with ground pepper—and stir well. Pour into serving bowl. Store any leftover in airtight container and keep refrigerated. If desired, make ahead the night before, then bring to room temperature before serving.